Venus Optics continues to prove it's possible to succeed in the lens business by producing enough niche lenses to attract attention, and evidently buyers. There's no doubt that the Probe lens will never be an essential optic in every kit bag, but if you value uniquely creative shots over lens portability and everyday versatility, the 24mm Macro Probe may well be worth its serious asking price. One of the most unusual lenses at Photokina 2018, Laowa’s radical Probe lens rips up the macro rule book with its unusually wide 24mm focal length and 2cm close focusing distance. Traditional macro lenses usually have longer focal lengths and focusing distances to deliberately keep you away from a subject, minimizing the chance of you and your camera casting shadows, or disturbing a camera-shy insect. But Laowa's Probe lens is different. 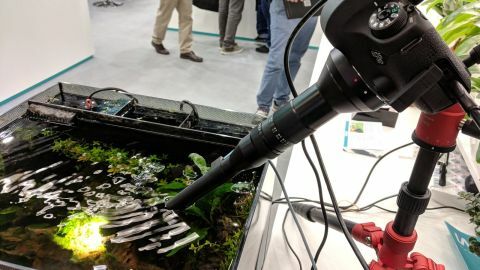 It's designed so you can stick its snout right into the action to capture a bug-eye perspective in the depths of the undergrowth, while also maintaining a greater depth of field to record more background context. Its narrow barrel keeps it (and you), fairly inconspicuous to your subject, though at 40cm long, expect to attract an entourage of onlookers wherever you shoot with it. Though a niche lens, the Probe is surprisingly versatile, with a relatively wide 84.1º angle of view. The 2:1 maximum magnification ratio is double that of a 'standard' macro lens and has the potential to reveal stunning detail, yet the lens's focus range stretches to infinity, so videographers can transition from a wide scene setting to ultra close-up in one shot. Within the 40cm-long barrel lies a complex 27-element optical stack arranged into 19 groups. Fancy glass includes a High Index Glass element, one ED element and two prisms. What's more, the lower portion of the lens barrel is waterproofed, so you can probe underwater environments as well as those on dry land. No ambient light? No problem: the Probe’s tiny 2cm-diameter tip even has its own ring light, powered via a Micro USB port on the lens barrel. Built-in illumination is doubly useful given the very narrow f/14 maximum aperture. This helps you capture more depth of field than you'd usually expect from a conventional macro lens, but you'll need plenty of light to compensate for the reduced light hitting your camera's sensor, or else ramp up its ISO sensitivity. Despite its tiny tip, the Probe will still cover a full-frame sensor and has mount options to suit Canon EF, Nikon F, Pentax K and Sony FE bodies. The first thing that strikes you when you see the Probe lens in person is its sheer length. 40cm is long for any lens, but the Probe's mostly narrow diameter creates the optical illusion that it's longer still: this is a lens like nothing else you've seen attached to a lens mount. But while certainly large, it isn't overly heavy. At 474g the Probe is lighter than most conventional full-frame macro lenses. Once the initial novelty factor has worn off (and that can take some time!) we were struck by the quality fit and finish of the metal lens barrel. A good thing, as when the Probe goes on sale it's expected to carry an RRP of £1,599. Focusing and aperture adjustment rings are situated far back on the lens to maximize the length of the waterproofed lower barrel section. Both operate very smoothly, with the focusing ring having enough rotational travel to make subtle focusing tweaks quite easy. With a lens this specialized and a barrel so narrow, it's no surprise that focusing is manual-only, though this isn't such a problem given the slower, more considered nature of macro photography. Aperture adjustment is also manual, ranging from the f/14 maximum down to f/40. Our sample lens was set up to film an underwater scene, where the built-in LED ring light proved to be very effective. The spread of light is narrow, but it's more than wide enough to create uniform illumination across a scene being viewed at the intended close range. The LED colour temperature also seems to be fairly neutral, though we weren't able to fully test this. It's not often a new lens is released that really impresses us. The norm is incremental updates to long-standing designs, and while the vast majority of lenses out there are well engineered, high performing optics, their excellence is measured by traditional metrics like sharpness, distortion, maximum aperture, and autofocusing speed. But what you get here is something truly unique, in philosophy, design, and the results it provides. While its physical operation is little different to a more conventional fully-manual lens, you will need to think more carefully about lighting and especially composition to fully exploit its potential. Though capable of capturing compelling close-ups, the niche nature of this slender beast and its very narrow aperture mean it's unlikely to replace a traditional macro lens. Factor the not insignificant price tag in, and this is therefore one serious novelty lens, but one that is far from just a toy. We look forward to getting a review sample of the Probe lens into our testing labs to fully scrutinize its image quality.